Under guise of preventing fraud the ECB voted to kill the €500 note. Fraud was not the real reason. The real reason was to make it more difficult for banks to store physical cash to avoid negative interest penalties... but it's not working. Please consider Banks Seek Cheap Way to Store Cash Piles as Rates Go Negative. 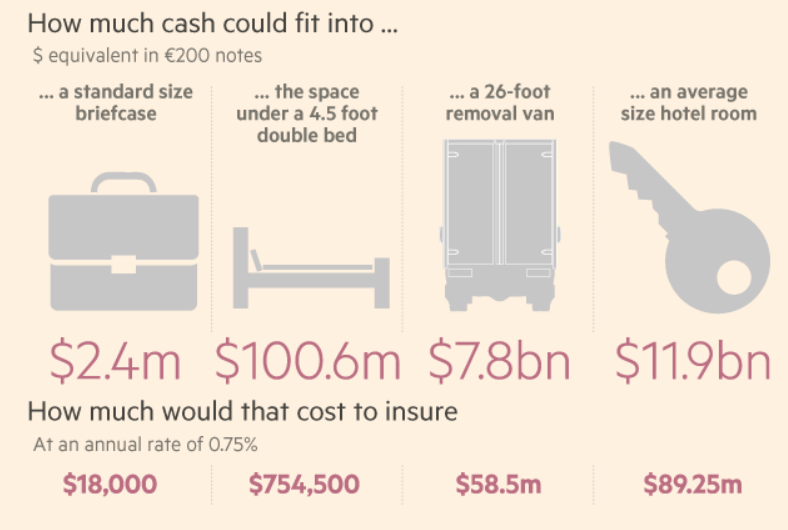 The idea of keeping piles of cash in high security vaults may sound like something from an old movie plot, but some banks and insurers have recently started considering the idea as interest rates sink below zero across much of Europe. After the European Central Bank’s most recent rate cut in March, private-sector banks are paying what amounts to an annual levy of 0.4 per cent on most of the funds they keep at the eurozone’s 19 national central banks. This policy, which has cost banks around €2.64bn since ECB rates became negative in 2014, is intended to spark economic growth by giving banks the incentive to lend money out to businesses instead of holding on to it. European central bankers say they could cut rates again should economic conditions worsen, but private bankers and insurers are already thinking of creative ways to avoid those charges altogether. One way is by turning the electronic money they keep at central banks into cold, hard cash. Munich Re has experimented successfully with storing a double-digit million sum of euros in cash at what the insurer describes as a manageable cost. A few other German banks, including Commerzbank, the country’s second-biggest lender, have also considered taking the step. But when a Swiss pension fund attempted to withdraw a large sum of money from its bank in order to store it in a vault, the bank refused to provide the cash, according to local media reports. If this practice becomes widespread, it would have big economic implications. If banks are not paying central bank interest charges, then they will not be as affected by further official interest rate cuts. They therefore would not be spurred to lend out more money. Lending is a function of the willingness and ability of banks to lend, and the willingness of creditworthy (or deemed by the bank as creditworthy) borrowers to take on loans. Banks can make mistakes in regards to credit worthiness as they did in the housing bubble, but if banks believe they will be paid back (or bailed out by rising asset prices), enough to compensate for the risk of lending, they will lend. Capital impaired banks cannot or will not lend, regardless of what stress tests show. It is impossible for banks to lend excess reserves in a way that reduces excess reserves except to another bank that is short of reserves and needs them. Otherwise, loans just get redeposited somewhere. It’s the size of central bank balance sheets that has created the massive pile of excess reserves. If banks aren’t lending, they are either capital impaired or they do not have creditworthy customers willing to borrow. Negative interest rates add to banks expenses, eating at bank profits, making them less likely to lend. It’s a mystery why central banks think making banks more unprofitable will spur lending, especially when excess reserves cannot be lent. To top it off, Low interest rates punish savers who have less money to spend than they would have at higher interest rates. For further discussion please see Self-Defeating Central Bank Interest Rate Policies.